Located south of Anchorage near the town of Seward lies Alaska’s smallest national park. Carved by glaciers flowing from the Harding Icefield to the sea, Kenai Fjords National Park is a rugged arctic landscape and rich habitat for marine animals and other wildlife. Kenai Fjords National Park is most easily accessible from the town of Seward, Alaska. Visitors can fly into Seward Airport or drive theSeward Highway, a National Scenic Byway connecting Anchorage to Seward. A good place to start a visit to Kenai Fjords is one of the park’s visitor centers. The main information center is located at 1212 4th Avenue in Seward next to the Small Boat Harbor while the Exit Glacier Nature Center is located on Exit Glacier Road. Both visitor centers are open from Memorial Day through Labor Day. Exit Glacier is accessible by road during the summer and by snowmobile, dogsleds and cross country skis during the snowy months. From here, all of the official trails are accessible. You can see and hear an active glacier shape the landscape. The Harding Ice Field is a spectacular ecological reminder of ice age times. The Harding Ice Field was created more than 23,000 years ago and spans 700 square miles of glacier ice at depths of up to one mile thick. At least 38 glaciers flow from the ice field. The backcountry coastline is accessible by sea and are rich with scenery and marine wildlife. Kenai Fjords is open year-round. Some areas, such as the coastal backcountry and road to Exit Glacier, are closed during the winter and early spring. Planning ahead is a necessity. Many outfitters and activities require advanced reservations. Ensuring a safe visit to the park is crucial as well as bears, falling ice, extreme weather, and avalanches can be encountered depending on where a visitor chooses to venture. There are activities for everyone in the park. By sea, boat tours are offered daily during the summer months and kayaking offers experienced paddlers a chance to tour the coastlines and harbors of the park up-close and personally. Hiking from Exit Glacier is highly recommended. Park rangers lead several walks daily. For more adventurous visitors, the 8.2-mile roundtrip Harding Icefield Trail climbs more than 3,000 feet and takes six to eight hours, but provides spectacular view of expansive ice. Those wanting to see the ice field without the strenuous hike can tour the ice field on a scenic overflights. Fishing, snowmobiling and mountaineering are other popular activities many visitors enjoy. Wildlife is plentiful in Kenai Fjords National Parks in the interior of the park, on the coastlines and in the ocean waters. Black bears are most often seen near Exit Glacier or foraging on shrubs on mountain ledges. Brown bears and grizzly bears are the same animal. Brown bears usually refer to those that wander the coastline feeding on salmon. Grizzly bears reside more in the interior where their limited access to protein is limited causes them to have a lighter coat and be generally smaller in size. Moose roam the streams and lakes in the summertime and seek shelter from the winter snows in the forests. Mountain goats, which actually belong to the antelope family, are incredible climbers and showcase amazing agility traversing the steep terrain of the rugged mountains. Towards the coastlines of the sea, visitors may encounter harbor seals, Stellar sea lions, and sea otters. The ocean is rich with some of the largest sea mammals in the world. Killer whales, humpback whales, and fin whales make whale watching a popular activity. Pacific white-sided dolphins and Dall’s porpoises delight users as well. Bald eagles, puffins and peregrine falcons make birdwatching a treat in Kenai Fjords National Park. The first known European to view the Kenai Peninsula, in 1741, was Captain Vitus Bering. Resurrection Bay got it’s name for being a refuge from Pacific storms from Alexander Baranof, who established a ship-building port on the west side of the bay in 1793. It was not until 1884 that the first American settlement near Seward was established. In 1898, work began on a railroad connecting the peninsula to the interior that was completed in 1915. 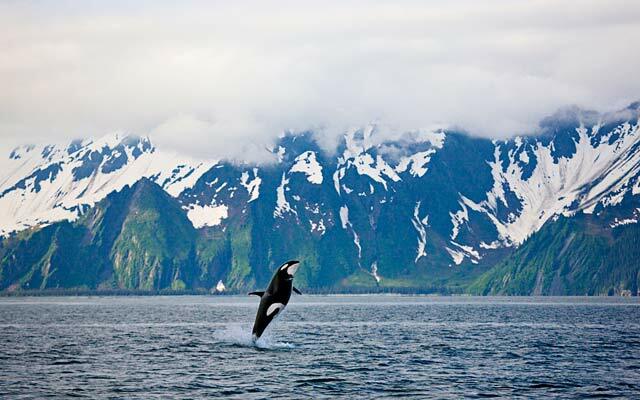 Kenai Fjords National Park was established in 1980 by the Alaska National Interest Lands Conservation Act. Click to see a detailed Kenai Fjords National Park map.